Perhaps Nasr-ed-Din Hodja had been sitting too long in the warm coffee house swapping yarns with his friends. His boasts were growing bigger and bigger. None was bigger than the Hodja's. "I could stand all night in the snow without any fire to warm me." The Hodja noisily gulped down one more hot cup of sweet black coffee. "No one could do that!" One of the men shivered as he looked through the window at the falling snow. "I could!" The Hodja spread his hands over the open pan of burning coals. "I'll do it this very night." "I will! If I have so much as a glow of fire to warm myself, I'll - I'll - I'll give a feast for you all at my house tomorrow!" The friends of Nasr-ed-Din Hodja went home to their warm beds, while he stood alone in the snow-draped market square. He had never realized how much the longer the hours were at night than in the daytime. He had never realized how many hours there were in the night. Once in a while a prowling dog or an adventuring cat would sniff at him, and then slink off to a snugger spot. The cold snow swathing his feet and tickling his neck was hard enough to bear. Harder still was the sleepiness that plagued him. It would never do to fall asleep in the snow. He must keep awake to stamp his cold feet and beat his cold arms. He found that it was easier to fight off sleep if he fastened his eyes on the flickering candle in Mehmet Ali's house across the market square. There was something cheering about the wavering of that tiny flame, which helped his tired eyes stay open. Morning came at last. Curious men met the shivering and yawning Hodja on his way home to a cup of hot coffee. They asked about his night and marveled at what he had done. "How did you keep awake all night?" they asked. "I fixed my eyes on a flickering candle in Mehmet Ali's house," he answered. "Did you say a candle?" "Of course!" The Hodja saw no harm in watching a candle. "A lighted candle gives flame. Flame gives heat. You were warming yourself by the heat of that candle. You have lost your wager." At first the Hodja tried to laugh at their joke, but he soon found that they were not joking. For once, the Hodja was too tired to argue successfully. Try as he would, he could not convince his friends that a candle in a distant house could give no warmth to a cold man standing in a snowy market square. "What time shall we come for the feast at your house tonight?" The laughing men gathered about the Hodja, insisting that they had won the wager. "Come at sunset," said the Hodja. He plodded drearily toward home. He was cold and very tired, but he was thinking - and thinking hard. Just after the muezzin's musical voice sent the sunset call to prayer trilling over Ak Shekir, a group of men knocked at Nasr-ed-Din Hodja's street gate. It creaked open for them. They walked across the courtyard and left their shoes in a row beside the house door. They entered the Hodja's house and sat cross-legged on the floor. "Dinner is not quite ready." It was the Hodja's voice from the kitchen. "Oh, that's all right," called the men. "We are in no hurry." They waited. There was an occasional footstep in the kitchen, but no sound of clattering dishes. They sniffed the air to guess what the feast might be, but they could smell no cooking food. They waited - and waited - and waited. "I hope you are not hungry," called the Hodja from the kitchen. "Dinner is not quite ready yet." "Perhaps we could help," suggested a hungry guest. "Fine," called the Hodja. "You might all come out in the kichen to help." The men, glad of anything to do, stretched their cramped legs. As each man entered the kitchen, there passed over his face a look of surprise and then a sheepish grin. 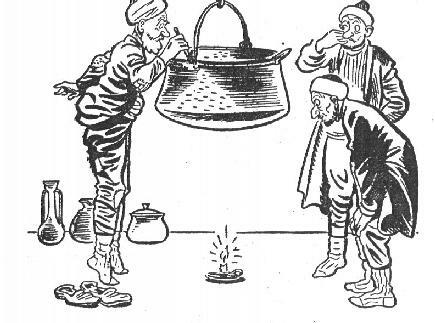 There stood the Hodja earnestly stirring the contents of a big copper kettle which was suspended high in the air. Far below it burned one flickering candle. "Just a few minutes!" The Hodja, standing a-tiptoe, peeered into the cold kettle. "It should boil before long. A candle gives so much heat, you know!"